Adamson-Eric studied in Germany, Italy, Spain, France and elsewhere. Even though he was generally very productive, the period immediately prior to 1933 was more leisurely in Adamson-Eric’s creative work: his father had died a few years before, then he himself came down with the measles and went on vacation in Spain to treat his health. Adamson-Eric returned to Estonia in 1932 and with the exception of a trip to Greece in 1934, he remained living permanently in Estonia. The generally accepted position is that his previous creative phase ended then and a new phase began. Adamson-Eric was not active in painting at all at the end of the 1950’s and the beginning of the 1960’s. Mainly, his work in applied arts is known, yet rather few paintings. It is possible that this can be explained by the hardships he had endured in the preceding years: sackings, condemnation, ejections and a heart attack. True, his most difficult years were already behind him. Adamson-Eric was a professor once again and now knew how to paint with his left hand as well. It has been noticed that it is just now that a new period of ascent began in his creative work. He once again painted natural settings, yet altogether more exuberantly and more richly coloured than before, focusing primarily on subjects from Lohusalu, where he went to recuperate his health. “These are narrow, intimate segments from nature – a tiny group of trees, a few pine trees, a path through the woods, a little house at the edge of the woods,” wrote Leo Soonpää. Adamson-Eric was 31 years old when he completed this work and had just returned from long years of studying and travelling in Germany, Italy, Spain, France and elsewhere. He had studied in various free academies and under the guidance of different teachers, including Georges Braque and André Lhote. He had already received important opportunities for holding exhibitions abroad when he was in his mid-20’s (including at the Tuileries salon; the purchase by the Jeu de Paume Museum in 1929 is also noteworthy) and earned somewhat controversial recognition in Estonia as well. A certain turn took place in his work in the early 1930’s and his still-lifes from that period are sometimes considered as part of that turn, and at other times as taking his previous style to its highest level. “These canvases have an established form and structure, and they present the artist to us as a well-equipped, mature master,” wrote one critic. During this period, Adamson-Eric started taking ever more interest in replacing realistic truthfulness with problems of colouring and form. “Form, tone and substance do not yet evoke the aura of things, their atmosphere. Sharp contours kill atmosphere. 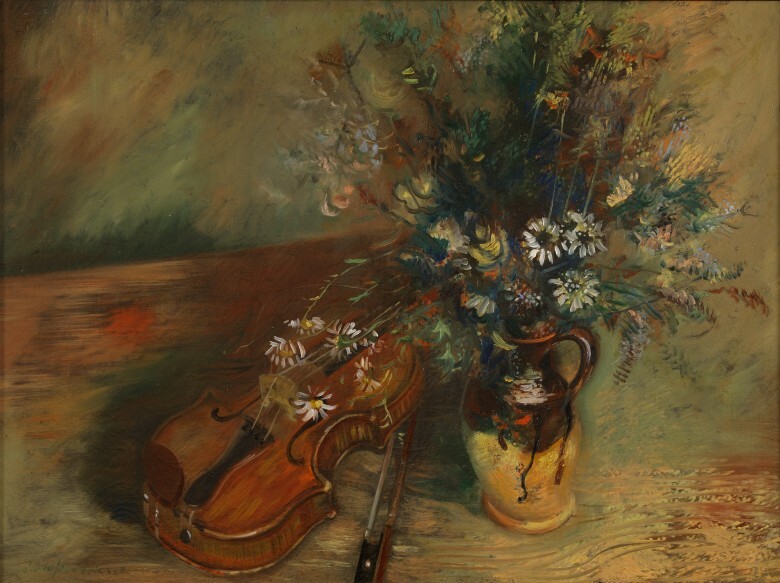 And he starts to blur contours – Still-life with Violin and Flowers and other works are examples of this,” was written back then. Adamson-Eric studied violin for three years in his youth and he has depicted that instrument often. Flowers were one of Adamson-Eric’s favourite subjects throughout his work in painting. A large solo exhibition of 148 of Adamson-Eric’s works was held in February of 1938 in Estonia’s main exhibition hall, the Tallinn Art Hall. The exhibition drew 12 000 visitors in eight days. That has remained an unsurpassed record to this day. Another solo exhibition that earned abundant complimentary reviews was held in Stockholm in 1939 and many of his works were sent in that same year to exhibitions of Estonian art in Rome, Budapest and Antwerp. 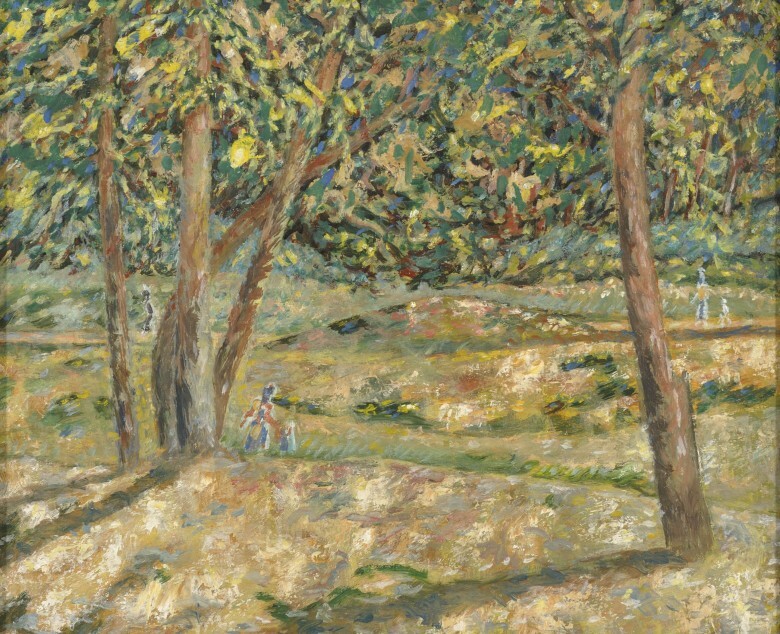 Painting nudes in natural settings was a very frequent subject in his work of that period, as was his impressionistic approach. One critic of that time noted: “While until then, he had so to speak dragged the paintbrush across the canvas in more or less continuous brushstrokes, now the paintbrush starts to hop, to skip with short strokes as flashes in cascades. 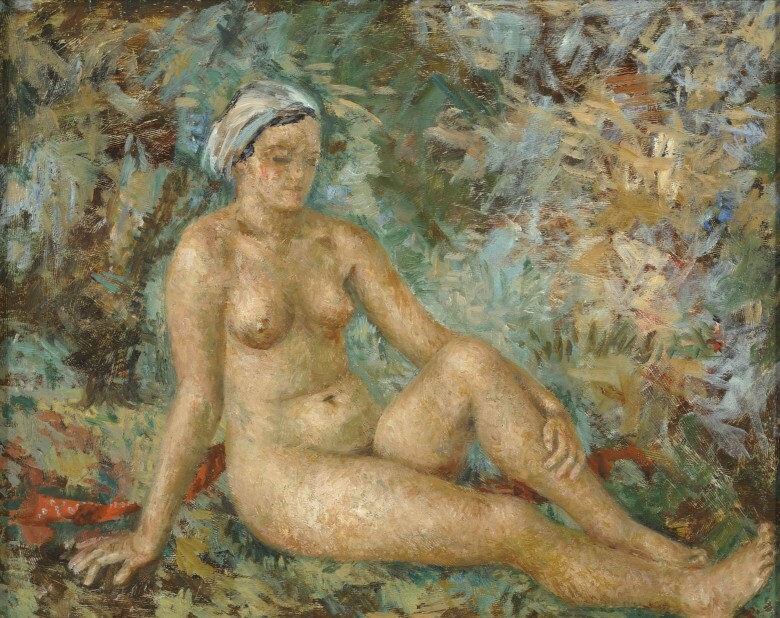 This luxuriant plaiting of specks of colour, commas and bits of lattice preserves the reality of objects, yet removes their corporality, materiality.” Incidentally, Adamson-Eric’s nudes gave rise not only to artistic questions but also to questions of a moral nature. Newspapers received letters from annoyed readers, and moralising remarks were made about his works in “society”, calling his works pornographic. Adamson-Eric was 58 years old in 1960. He had survived a serious heart attack and paralysis of the right side of his body a few years before then. Seven years before then he had also worked as an unskilled worker at an integrated plant manufacturing footwear since the Soviet public authorities had denounced him as a formalist and he found himself out of favour. Nevertheless, Adamson-Eric had survived those ordeals. He had learned to paint with his left hand and after the political situation changed, he was appointed as a professor to the art university. At the same time, Adamson-Eric was no longer active in painting at all at the end of the 1950’s and the beginning of the 1960’s. Mainly, his work in applied arts is known, yet rather few paintings. Paintings of flowers and small format landscapes that primarily depict motifs from Laulasmaa are what he mainly completed during that period. This particular work was also completed in Laulasmaa near Tallinn, where he spent his summers recuperating after the heart attack that he had suffered. Adamson-Eric’s quiet and effortless self-expression can be seen in this painting in a small, unobtrusive format, which along with his other works from the 1960’s did not attract the attention of the public.